Mappin features a web-based administrator or admin interface so you don’t need to edit any files. 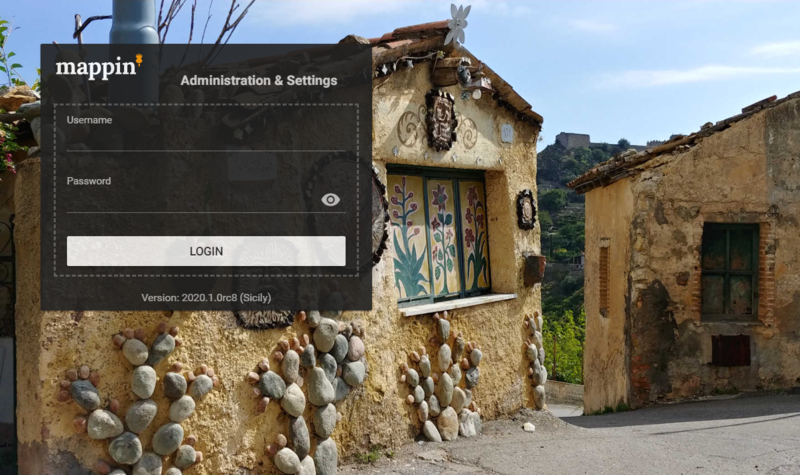 The administrator interface can be accessed at https://YOU-admin.cloudmappin.com where YOU is your unique customer ID. Mappin’s administrator interface is password protected. By default, the username is admin which you will have received a password for when you signed-up. New administrator accounts can be created for administering Mappin but at present, these accounts need to be created by the Mappin Support Team. Please contact us if you need this. Mappin supports multiple projects. When you first log-in you’ll see a list of projects (probably just demo initially). Settings are per-project so you first need to select which project to administer. With a project selected, the administrator interface is split into four main sections (Modules, Layers, Cache Settings and Logs). The various settings are discussed in detail in the rest of this guide. Notice the name of the project we are administering, demo, in the top-right corner. When you make a change to a setting, you’ll note that the administrator interface highlights these changes with an orange pencil icon (see below) and also lists a summary of pending changes in the bottom-right. You can use the SAVE/DISCARD CHANGES buttons to discard or apply pending changes. Please note the RESTORE MODULE button discards changes to the current module only but the DISCARD CHANGES button discards all pending changes. The gear icon in the top-right corner shows the menu below. 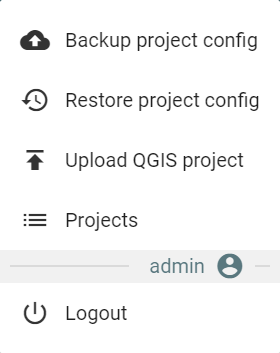 From here you can logout, go back to the list of projects or backup / restore the project configuration. Backup-up the project configuration writes to a backup file on the server at this time. Likewise with restoring the project.